DURING THE TIME OF 1775 TO 1783, OUR NATION WAS BORN. After numerous battles fought against Red Coats, the United States of America became a nation free of the heavy handed Monarchy and a place for the people and by the people; a land where differing opinions were encouraged, and speaking out against those in power did not mean imprisonment or death. Instead, for the first time, it meant that there was a possibility for change that reflected the good will of all people. ESTABLISHED AS A FEDERAL HOLIDAY IN 1941, BUT CELEBRATED SINCE THE EIGHTEENTH CENTURY, the Fourth of July is the biggest Birthday Bash in our country. From East to West, our nation and its people take the day to recollect and be grateful for the sacrifices made by those long ago to give us the freedom we have today… Even if John Adams believed that the holiday should have been celebrated on July 2nd, and probably would not have accepted an invitation to your Independence Day party if it was held on July 4th, but his right to not celebrate is as much an example of our freedom as anything else, right? With backyard barbeques, and late night fireworks (big and small) bursting in air in our immediate future, we’ve comprised a helpful list of a few key note products that will serve you well this Independence Day! If we’re talking outdoor entertaining, all of our products are well adapted to survive the perils of festivities hosted out in nature; but our top outdoor all stars are definitely the newly introduced SUPER SIPS COLLECTION of Drinkware, and our tried and true, SUPER BOWLS COLLECTION of Serving Bowls! Both collections have easy match lid systems, multiple lid styles, and are made with high-clarity and durable PET plastic; which will ensure your serving is SAFE AND SECURE! Our SAVVI SERVE COLLECTION is another array of disposable FINELINE SETTINGS meal and drinkware products that can cover all of your bases in spades. With its clear and neon color options for your table setting needs, your summer shebang will be easy, affordable and exciting! 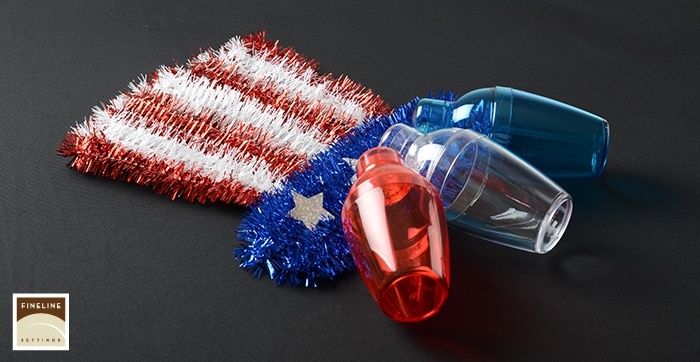 Our disposable QUENCHERS SHAKERS in BLUE, RED and CLEAR are the perfect complement to your firework watching! Shake up the fun and make a toast to our forefathers in celebration of our freedom, and the family and friends we are fortunate enough to share it with. FLS 4TH OF JULY 2015 Top “PIN-IT” List! Make sure you have the best THREE-DAY-WEEKEND this year, and celebrate to the fullest with your family and friends. 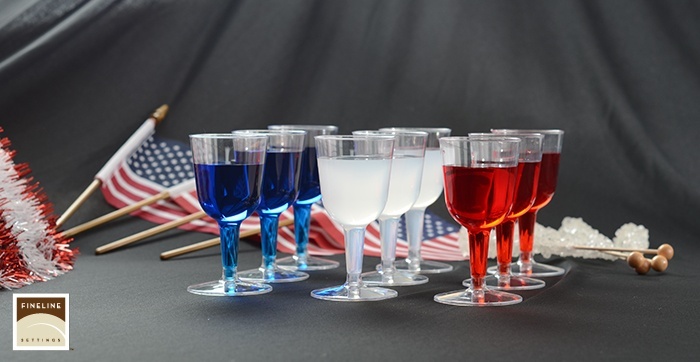 Let us know how our products help make your July 4th entertaining convenient and stylish, because we love hearing about all the unique and innovative ways you guys come up with to use our product line!